Piedmont gained independence from France at the Peace of Cateau Cambrésis due to the role played by the duke Emmanuel Philibert of Savoy in the battle of St Quentin during the Italian War of 1551–1559. The House of Savoy was "Italianized" at the end of the Italian wars, as Emmanuel Philibert made Turin the capital of the savoyard state and Italian the official language. The House of Medici kept ruling Florence, thanks to an agreement signed between the Pope and Charles V in 1530, and was later recognized as the ruling family of the Grand Duchy of Tuscany by Pope Pius V. The same Pope arranged the Holy League, a coalition of Venice and other maritime states that defeated the invading Ottoman forces at the naval battle of Lepanto (1571). The Papal States launched the Counter-Reformation, which lasted from the Council of Trent (1545–1563) to the Peace of Westphalia in 1648. This period coincides with the European wars of religion and saw numerous Italians active in other catholic nations, including de facto rulers of France (such as Catherine de Medici, Mary de Medici, Concino Concini and Jules Mazarin) and military generals serving under the auspices of the Holy Roman Empire or Spain (such as Torquato Conti, Raimondo Montecuccoli, Ottavio Piccolomini, Ambrogio Spinola and Alexander Farnese). Despite the victory at Lepanto, the Venetian Empire gradually lost its Eastern Mediterranean possessions (including Cyprus and Crete) to the Ottomans. Venice captured the Peloponnese during the Great Turkish war (1683–1699), but the land was ceded back after the last of the Venetian-Ottoman Wars. When the Seven Years' War broke out, Venice was left out of the concert of great powers: the same, however, was true for the Venetian mediterranean rivals such as the ottoman Empire (sick man of europe after centuries of warfare) and the Genoese Empire who had lost its possessions in the Aegean Sea, in Tunisia, and, later, Corsica. The crisis of Genoa led to the crisis of Spain, as the Republic of Genoa was a key ally of the Spanish Empire since the 16th century, providing credit and economic support for the Habsburgs in what has been described as the age of the Genoese. The War of the Spanish succession (1702–1715) and the War of the Quadruple Alliance (1718–1720) established Habsburg Austria as the dominant power in Northern and Southern Italy (though the war of the Polish Succession resulted in the re-installment of the Spanish in the south, as the House of Bourbon-Two Sicilies). In this context Victor Amadeus II of Savoy, along with Eugene of Savoy, defeated the Franco-Spanish forces during the Siege of Turin (1706) and later formed the kingdom of Piedmont-Sardinia, predecessor state of Italy. The House of Habsburg-Lorraine succeeded the Medici of Florence in 1737 and Venice also became part of Austria with the treaty of Campo Formio in 1797. Napoleon, far more Italian than French, Italian by race, by instinct, imagination, and souvenir, considers in his plan the future of Italy, and, on casting up the final accounts of his reign, we find that the net profit is for Italy and the net loss is for France. Since Theodoric and the Lombard kings, the Pope, in preserving his temporal sovereignty and spiritual omnipotence, has maintained the sub-divisions of Italy. Let this obstacle be removed and Italy will once more become a nation. Napoleon prepares the way. The Italian Wars saw 65 years of French attacks on the Italian states, starting with Charles VIII's invasion of Naples in 1494. However the Peace of Cateau-Cambrésis (1559) saw almost all of Italy fall under the direct or indirect control of the Spanish. The War of the Spanish Succession saw control of much of Italy pass from Spain to Austria, culminating in the Treaty of Utrecht of 1713. The Spaniards regained Naples and Sicily following the Battle of Bitonto in 1738. Galileo's first observations of the moons of Jupiter. Spanish and Austrian hegemony was not always based on direct rule; states such as Venice, Genoa, the Papal States, the duchies of Este, and Duchy of Savoy, were the only independent states, while a large part of the rest of Italy relied on the protection of Spain or Austria against external aggression. Furthermore, those areas under direct Spanish and (later) Austrian control were theoretically independent principalities bound to the Spanish and Austrian empires through personal unions alone. Italy began to experience an economic and social decline as the 16th century progressed. The Age of Discovery had shifted the center of trade in Europe from the Mediterranean to the Atlantic, and so the Italian states lost much of their previous importance. Venice continued to fight bitterly with the Ottoman Empire for control of outposts in the eastern Mediterranean. It participated in the great naval battle of Lepanto in 1571, and in the following century battled the Turks for 25 years until 1669, when it gained control of the Peloponnese in Greece. Venice experienced one last great martial triumph by helping to defeat the Ottoman Empire in the war of 1683–1699. By the 18th century, economic activity dwindled as the city withdrew in on itself and fell into stagnation, becoming easy pickings for the French revolutionary armies in 1796. The Papal States also lost much of their former power as the Protestant Reformation divided Europe into two camps. The remaining Catholic princes increasingly sought to be the masters in their own houses and often clashed with the papacy over jurdistrictional matters. During the unceasing rivalry between France and Spain, Europe's two great Catholic powers, the popes often acted as mediators. Relations with Paris deteriorated sharply during the reign of Louis XIV, until he and the papacy found common ground in suppressing Jansenism. Even in Italy itself, the political importance of the Papal States declined. The Counter-Reformation popes largely concerned themselves with religious matters and church reform, and so had little time for politics. They worked to fight brigandage, long endemic in the Papal States, reformed the court system, and embellished Rome with many buildings. Gregory XIII introduced the calendar that bears his name, and the papal fleet participated in the Battle of Lepanto. In addition to its loss of political power, the Church came under increasing attack during the Age of Enlightenment in the 18th century. As Spain declined in the 16th century, so did its Italian possessions in Naples, Sicily, Sardinia, and Milan. Southern Italy was impoverished, stagnant, and cut off from the mainstream of events in Europe. Naples was one of the continent's most overcrowded and unsanitary cities, with a crime-ridden and volatile populace. The Neapolitan aristocracy long resented Spanish rule and welcomed the arrival of the Austrians in 1707. However, they were disappointed as Vienna continued the practice of not allowing any autonomy to Naples. While the war raged, Austria imposed huge tax burdens on the city and did not begin to provide it with any adequate administration until peace returned. Graf von Daun (viceroy of Naples from 1713 to 1719) attempted several reforms, but came into dispute with the church over jurisdictional matters. He largely succeeded in making peace with Rome, but international strife caused the Austrian emperors to impose more taxes on Naples and neglect all but the city's traditional feudal lords. Cardinal Michael Friedrich von Althann next became viceroy (1722–1728), but upset the nobility (already reeling from imperial taxes) and the middle class with his pro-clerical stance. Althann's downfall came by attempting to establish a state bank (the Banco di San Carlo) with the intention of acquiring crown lands for the Austrian emperor. He infuriated both the nobility and middle class with this ill-conceived campaign, and after his expulsion Naples suffered several tumultuous years of famine and social unrest, with international problems preventing any attempt at administrative reform. It was with relief that the Spanish born Don Carlos ascended the throne of a reborn Kingdom of Naples in 1734. In 1759, he left to become King Charles III of Spain and was succeeded by his son Ferdinand, who was underage and so government was left to the regent Bernardo Tanucci. In the spirit of the Enlightenment, Tanucci attempted to establish a benevolent despotism by a series of reforms and weakening the power of traditional Neapolitan institutions. Ferdinand came of age in 1767, but had little interest in government and was largely dominated by his wife the Archduchess Maria Carolina, who disliked Tanucci's pro-Spanish stance and managed to replace him with Sir John Acton, an English emigre. When the French Revolution erupted, they allied with Austria and Britain against France. Sicily on the other hand experienced peaceful relations with Madrid, as the Spanish largely allowed the island to manage its own affairs. Since it was an important outpost in the Mediterranean as well as a significant trading partner of Spain, friendly ties were valued. After Sicily passed under Austrian rule in 1720, trouble erupted as Vienna stationed permanent garrisons of German-born troops on the island, provoking frequent and violent confrontations with the local populace. The corruption and backwardness of Sicilian society made it difficult to establish a working government, and much like Naples Sicily was forced to pay massive taxes and tribute to Vienna. However, Emperor Charles VI attempted to build up Sicily's economy by turning Messina and other locations into important ports so as to attract foreign commerce, as well as shore up the island's failing grain and silk industries. But the emperor could not offset an economic downturn that was beyond his control, and many of his projects proved unfeasible, ultimately causing a near-total economic meltdown. Charles had a tricky religious situation in Sicily where the king traditionally served as apostolic legate, which he sought to maintain at all costs while also promising to defend the Catholic faith. He and his ministers successfully debated the legateship with the popes and made peace with the Vatican. In the end however, Austrian rule made little lasting impact on Sicily and Spanish troops took possession of the island in 1734. Sardinia also was left to itself and many Spaniards settled on the island, which had an economy mostly based on sheepherding and which had little contact with the rest of Italy. The Enlightenment played a distinctive, if small, role in 18th century Italy, 1685–1789. Although most of Italy was controlled by conservative Habsburgs or the pope, Tuscany had some opportunities for reform. Leopold II of Tuscany abolished the death penalty in Tuscany and reduced censorship. From Naples Antonio Genovesi (1713–69) influenced a generation of southern Italian intellectuals and University students. His textbook "Diceosina, o Sia della Filosofia del Giusto e dell'Onesto" (1766) was a controversial, attempt to mediate between the history of moral philosophy, on the one hand, and the specific problems encountered by 18th-century commercial society, on the other. It contained the greater part of Genovesi's political, philosophical, and economic thought – guidebook for Neapolitan economic and social development. Science flourished as Alessandro Volta and Luigi Galvani made break-through discoveries in electricity. Pietro Verri was a leading economist in Lombardy. Historian Joseph Schumpeter states he was ‘the most important pre-Smithian authority on Cheapness-and-Plenty’. The most influential scholar on the Italian Enlightenment has been Franco Venturi. The French Revolution had attracted considerable attention in Italy since its beginning, inasmuch as the reform attempts of enlightened despots throughout the 18th century proved largely abortive. Masonic lodges sprang up in large numbers during this period where radical changes were discussed by the intelligensia, away from the clumsy efforts mentioned above. Predictably, the establishment in Italy was totally hostile to the ideas coming out of France and harsh crackdowns were launched on dissent. As early as 1792, French armies had penetrated Italian soil, and that same year, the impoverished Piedmontese peasants warned their king that he might too face justice as had happened to Louis XVI in France. The middle class in Rome revolted against the Vatican's political power, and their counterparts in Venice along with the nobility denounced that city's government. However, most of these protests accomplished little outside of Piedmont and Naples, and in the south a conspiracy hatched by pro-republican Freemasons was discovered and the ringleaders executed. Dozens of dissenters fled to France in the aftermath of the trials. One of these dissenters, Filippo Bonouarti, a member of an ancient Tuscan noble family, returned to Italy along with the French armies and briefly set up a revolutionary government in the Ligurian town of Oneglia. The privileges of the nobility were abolished and the Church establishment replaced by a universalist cult of the Supreme Being. But after Robespierre (whom Bonouarti modeled his government on) fell from power in France, he was summoned back home and his experiment quickly ended. This situation was shaken in 1796, when the French Army of Italy under Napoleon invaded Italy, with the aims of forcing the First Coalition to abandon Sardinia (where they had created an anti-revolutionary puppet-ruler) and forcing Austria to withdraw from Italy. The first battles came on April 9 between the French and the Piedmontese and within only two weeks Victor Amadeus III of Sardinia was forced to sign an armistice. On May 15 the French general then entered Milan, where he was welcomed as a liberator. Subsequently, beating off Austrian counterattacks and continuing to advance, he arrived in the Veneto in 1797. Here occurred the Veronese Easters, an act of rebellion against French oppression, that tied down Napoleon for about a week. On October 1797 Napoleon signed the Treaty of Campo Formio, by which the Republic of Venice was annexed to the Austrian state, dashing Italian nationalists' hopes that it might become an independent state. This treaty gave Austrian recognition to the existence of the Cisalpine Republic (made up of Lombardy, Emilia Romagna and small parts of Tuscany and Veneto), and annexed Piedmont to France. Even if, like the other states created by the invasion, the Cisalpine Republic was just a satellite of France, these satellites sparked a nationalist movement. The Cisalpine Republic was converted into the Italian Republic in 1802, under the presidency of Napoleon. As all of these republics were imposed by an outside force, none had any popular support in Italy, especially since the peasantry was alienated by Jacobin anti-clericalism. It would take a true grassroots movement to bring change. In addition, even native republicans became disillusioned when they realized that the French expected them to be obedient satellites of Paris, which included frequent interference in local affairs and massive taxes. Return to the old feudal order was however equally undesirable, and so the republican movement would gradually establish its goals as nationalism and a unified Italian state. After the War of the First Coalition ended, French aggression in Italy continued unabated, and in 1798 they occupied Rome, sent the Pope into exile, and set up a republic there. When Napoleon left for Egypt, King Ferdinand VI of Sicily retook Rome and reinstated the papacy. But almost as soon as his armies departed, the French returned and occupied Naples. Ferdinand's court was taken into exile by a British fleet. Another republic was set up (the Parthenopean) which governed in a more radical and democratic fashion than the others. But Ferdinand skillfully organized a counterrevolt led by his agent Cardinal Fabrizio Ruffo, who landed in Italy and rallied a peasant mob, which then retook Naples and proceeded to pillage and destroy the manor homes of the hated nobility. There were also mass murders of bourgeois who had supported the French. Afterwards, Ferdinand returned to his capital in triumph. 100 revolutionary leaders were summarily tried and executed. In northern Italy, the French occupied Tuscany during the spring of 1799 until another peasant uprising drove them out. Jews and suspected Jacobins were lynched en masse by the mob, and the nobility and Church quickly regained power. That fall, the Roman Republic also collapsed and the French were by now virtually cleared from Italy. After seizing power as consul in France, Napoleon launched a renewed invasion of Italy. Milan fell on June 2, 1800 and Austrian defeats there and in Germany ended the War of the Second Coalition. Austria retained only control of Venetia, while France dominated the whole rest of northern Italy, leaving only the weak papal and Neapolitan states in the south. Napoleon over the next few years coalesced his Italian possessions into a single Republic of Italy, ruled by one Francesco Melzi d'Eril. But in 1805, he decided to convert the republic into a kingdom ruled by his stepson Eugene D'Beauharnais. The Kingdom of Italy was gradually expanded as Austria relinquished Venetia in 1806 and other bits of territory were added. Still other Italian regions were annexed directly into France. In 1809, the French reoccupied Rome and took Pope Pius VII prisoner. Ferdinand VI's dominions in southern Italy remained independent for the first few years of the 19th century, but they were too weak to resist a concerted attack, and a French army swiftly occupied Naples in early 1806. Ferdinand's court fled to Sicily where they enjoyed British protection. Napoleon appointed his brother Joachim as king of Naples, but he governed only the mainland as Sicily and Sardinia remained outside of French control. During the years of Bourbon exile in Sicily, the British came to exercise political control over the island and forced Ferdinand to impose several democratic reforms. But when the Napoleonic Wars ended in 1815 and the king returned to Naples, he resumed governing as an absolute monarch. Joachim Bonaparte meanwhile pursued an independent policy from France, instituting several reforms that strengthened the middle class in Naples. However, he along with the rest of Napoleon's satellite rulers fell from power in 1814–15. In 1809, Bonaparte occupied Rome, and conflicted with the pope, who had excommunicated him. To maintain the efficiency of the state he exiled the Pope first to Savona and then to France, and taking the Papal States' art collections back to the Louvre. The conquest of Russia that Napoleon undertook in 1811 marked the end of the apogee of Italians' support for Napoleon, because many Italians died in this failed campaign. After Russia, other states of Europe re-allied themselves and defeated Napoleon at the Battle of Leipzig, after which his Italian allied states, with Murat first among them, abandoned him to ally with Austria. Defeated at Paris on April 6, 1814, Napoleon was compelled to renounce his throne and sent into exile on Elba. The resulting Congress of Vienna (1814) restored a situation close to that of 1795, dividing Italy between Austria (in the north-east and Lombardy), the Kingdom of Sardinia, the Kingdom of the Two Sicilies (in the south and in Sicily), and Tuscany, the Papal States and other minor states in the centre. However, old republics such as Venice and Genoa were not recreated, Venice went to Austria, and Genoa went to the Kingdom of Sardinia. ^ Dino Carpanetto and Giuseppe Ricuperati, Italy in the Age of Reason, 1685–1789 (1987). ^ Niccolò Guasti, "Antonio genovesi's Diceosina: Source of the Neapolitan Enlightenment." History of European ideas 32.4 (2006): 385-405. ^ Pier Luigi Porta, "Lombard enlightenment and classical political economy." The European Journal of the History of Economic Thought 18.4 (2011): 521-550. ^ Anna Maria Rao, "Enlightenment and reform: an overview of culture and politics in Enlightenment Italy." Journal of Modern Italian Studies 10.2 (2005): 142-167. Black, Christopher F. (2000). Early Modern Italy: A Social History. London and New York, NY: Routledge. ISBN 978-0-415-10935-2. ——— (2004). Church, Religion and Society in Early Modern Italy. Basingstoke: Palgrave Macmillan. ISBN 978-0-333-61844-8. Burke, Peter (1987). The Historical Anthropology of Early Modern Italy: Essays on Perception and Communication. Cambridge: Cambridge University Press. ISBN 978-0-521-32041-2. Carpanetto, Dino, and Giuseppe Ricuperati. Italy in the Age of Reason, 1685–1789 (1987). Cavallo, Sandra (1995). Charity and Power in Early Modern Italy: Benefactors and their Motives in Turin, 1541–1789. Cambridge: Cambridge University Press. ISBN 978-0-521-46091-0. Cocco, Sean (2013). Watching Vesuvius: A History of Science and Culture in Early Modern Italy. Chicago, IL: University of Chicago Press. ISBN 978-0-226-92371-0. Dooley, Brendan (1999). The Social History of Skepticism: Experience and Doubt in Early Modern Culture. Baltimore, MD: Johns Hopkins University Press. ISBN 978-0-8018-6142-0. Findlen, Paula (1994). Possessing Nature: Museums, Collecting and Scientific Culture in Early Modern Italy. Berkeley, CA: University of California Press. ISBN 978-0-520-07334-0. ———; Fontaine, Michelle; Osheim, Duane J., eds. (2003). Beyond Florence: The Contours of Medieval and Early Modern Italy. Stanford, CA: Stanford University Press. ISBN 978-0-8047-3934-4. Frigo, Daniella, ed. (2000). Politics and Diplomacy in Early Modern Italy: The Structure of Diplomatic Practice, 1450–1800. Cambridge: Cambridge University Press. ISBN 978-0-521-56189-1. Grafton, Anthony (1999). Cardano's Cosmos: The Worlds and Works of a Renaissance Astrologer. Cambridge, Massachusetts: Harvard University Press. ISBN 978-0-674-09555-7. Hanlon, Gregory (2000). Early Modern Italy, 1550–1800. London: Palgrave Macmillan. ISBN 978-0-333-62002-1. Jacobson Schutte, Anne (2001). Aspiring Saints: Pretense of Holiness, Inquisition, and Gender in the Republic of Venice, 1618–1750. Baltimore, MD: Johns Hopkins University Press. ISBN 978-0-8018-6548-0. Mallett, Michael; Christine, Shaw (2012). The Italian Wars, 1494–1559: War, State and Society in Early Modern Europe. Harlow: Pearson Education. ISBN 978-0-582-05758-6. Marino, John A., ed. (2002). 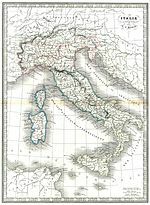 Early Modern Italy: 1550–1796. Oxford: Oxford University Press. ISBN 978-0-19-870041-8. Oresko, Robert (1989). "Power and Politics in Early Modern Italy". History Today. 39 (9). Wood, Jeryldene M. (2011) . Women, Art, and Spirituality: The Poor Clares of Early Modern Italy. Cambridge: Cambridge University Press. ISBN 978-0-521-29489-8. "Italy." Encyclopædia Britannica. 2006. Encyclopædia Britannica Online. April 30, 2006.